Common Ground is the coolest hangout spot in Seoul right now. Taking up a total of 5300 square meters in land space, Common Ground is South Korea’s first pop-up shopping district featuring 200 shipping containers used as retail stores. 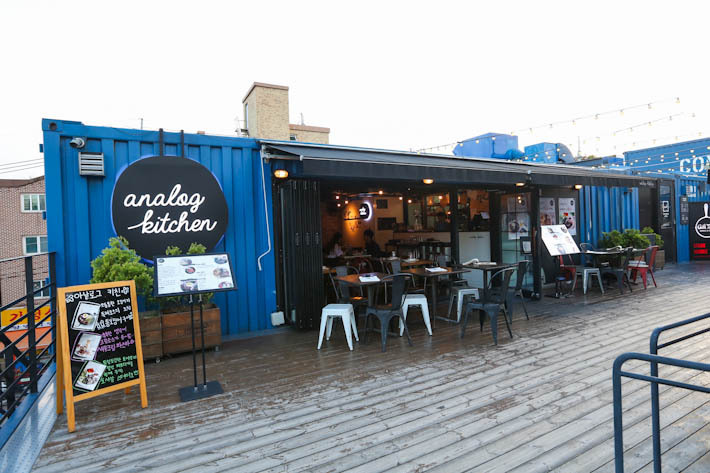 Yes, cargo containers are all the fad now because your regular brick-and-mortar shops just don’t cut it anymore. This is where you will find fashionable people from all walks of life gathering at this point because there is nowhere else they would rather be seen at. If you live and breathe fashion and lifestyle, read our guide to what you can expect at Common Ground. Common Ground is home to a wide selection of fashion brands, independent cafes and gourmet restaurants. The lifestyle destination is where you can spend at least half a day with your squad or significant other because there is much to see and do. The central square at Common Ground is where you will find the main pop-up of that week. A weekend market is held every week and it changes with time so visitors will always have something new to look forward to when they revisit this place. On some days, there will be events, exhibitions or performances to entertain visitors while they go about the place. Common Ground is perhaps best known for housing a sweeping range of fashion labels—from well-known mainstream brands to up-and-coming fashion designers that cater to both men and women. The first and second levels at Common Ground are dedicated to street market fashion, lifestyle products and accessories. This is the time to shop till you drop! Whether you are into basics or street style, you will definitely find what you like among the massive collection of clothing, accessories and shoes. Certain shops also have items on sale to clear their stock so do keep a lookout! Makeup junkies rejoice! You are definitely not neglected at Common Ground. Walk into the shops at the ground level and you will be able to find a neat range of makeup products being sold there. All that shopping is sure to build up your appetite and when you are ready to settle down for some bites, head up to the third level where you can choose to go for light cafe grub or a full meal. Dining options are aplenty and you can find restaurants which serve Korean, Western, Japanese and Thai cuisines. You can have your meal in the air-conditioned rooms or go for the al fresco seating during good weather to soak up the chill vibes. With fairy lights hanging across the rooftop terrace, Common Ground looks enchanting at night—definitely the perfect place for couples to go on a romantic date. Remember to take many beautiful pictures at the rooftop for keepsake! You have seen your friends flooding your Instagram feed with OOTD pictures at Common Ground so you know you cannot leave the place without a picture too. The huge space is also great for taking group photos with your squad mates. As this is a popular location for photography, you probably have to wait in line for a few minutes before you get your turn.